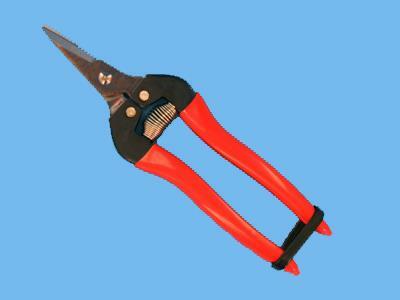 Fruit scissors straight model (pointed end), red. Equipped with anti-slip grip and very comfortable in the hand. "marquenched" hardened Knives: Gives the blades the best steel structure and longer cutting performance. Ideal for harvesting fruit, vegetables and flowers. The blue color is in accordance with the requirements of the HACCP.